Music, singing and dancing in relation to the use of the harp and the ram's horn or shofar in the Bible: What do we know about this? There are many possible approaches to describing the effects and uses of music in a particular society. It would be a mistake to assume that music in the Bible is not the cement of social life and has no liturgical significance. The present study seeks to explore how people in ancient times employed music using the harp and the ram's horn (shofar), to cope with roles that were open or never-ending in their demands. In particular, it focuses upon the role played by music in secular life as well as religious rituals, as described in the Bible. The method used was an extensive literature study of the Old and New Testament, textbooks and relevant peer reviewed journals, with a focus on both secular and religious reasons for singing, dancing and playing instruments. It was found that the Bible described the use of the harp and the ram's horn associated with singing and dancing during celebrations, for military use, as well as mourning or lamentation. It was concluded that music using different instruments, including the harp andshofar, helped people to cope with the demands of everyday life and thus played an important role in both secular life and religious rituals in biblical times. Music, particularly singing1, is such a strong ethnic symbol that is virtually indistinguishable from the culture itself. Studies of music and song in the Old Testament have tended to draw almost exclusively from textual references in the Bible itself (Sendrey 1969). These data are significant, especially when considered in light of their highly developed literary contexts (Braun 2002:116). Although the prohibition against images (Dt 20:4) prevented Israel from developing an impressive tradition of visual art like the Greeks and Egyptians, music played a central part in its life. Every facet of its life and every stage of its history were marked by music. Music was present when people greeted each other and said farewell (Gn 31:27; Lk 15:25), when they married and were buried (Jr 7:34 and 48:36), when they went off to war and were welcomed back from it (Jdg 30:34; Is 30:32). From the least to the greatest, biblical people sang and played instruments (1 Sm 16:18; Job 30:31). At the everyday level we find romantic songs, working songs and drinking songs (Song 1:9-17 and 2:15; Is 21:11-12 and 22:13; Ezk 33:32). Major events in the life of the people, such as the exodus from Egypt, conquering the Canaanites, recapturing the ark, dedicating the temple, crowning the king and returning from exile, were celebrated in music and song (Ryken, Wilhoit & Longman 1998:576). The first instrument mentioned in the Bible is the kinnor, translated as 'harp' in our version. Jubal is presented as 'the father of all such as handle thekinnor and ugab' (Gn 4:21). Music and musical instruments formed part of the religious and social culture of most of the nations of the Ancient Near East; especially in Palestine where it formed an important part of every aspect of their life and every phase of their history were marked by music (Ryken et al. 1998:576). The ram's horn [shofar], the harp and the lyre were the three musical instruments most commonly found in ancient cultures, including Palestine. Of these three instruments the ram's horn (shofar) played a very important role for the Israelites both in their religious life and on the battlefield. According to Sendrey (1969:342), it is the only instrument that survived history in its original form and is still used, although with curtailed functions. It has a prominent role to play in Jewish synagogues today (Douglas & Hillyer 1980:1039) and can even be seen on the mosaic floors and the capitals of synagogues (Keel 1994:342). As stated, the word shofar can be translated as 'ram's horn' or 'horn' (Werner 1962:474), but this seems to be disputable. The Hebrew word for horn is keren and not shofar (Buttrick & Crim 1962:472). It was in the synagogue, however, that music continued to flourish and serve as an emotional and didactic aid to the maintenance of Judaism: 'The Levitical guilds were now gone and instrumental music was forbidden in the synagogue, leaving vocal music to evolve in a new way' (Freedman 1992:934). This view is vividly corroborated by Begbie (2000:521-524), who states, inter alia, that Levitical instrumental worship music was absent from the synagogue after the destruction of the Second Temple in AD 70. This may be the reason why the New Testament does not mention instruments in the context of worship, although it should be noted that it does not prohibit or criticise such use. Mitchell (1978:22) mentions that singing becomes a kind of 'preparation'; for example, a 'prayer song' becomes not a prayer itself but rather a way to quiet the room and prepares people to pray. In such a case the music may help the experience of the spoken or silent prayer that follows. But this practice tended to erode meaningful singing, simply because it was perceived as a tool to accomplish a related task, rather than being something of importance in itself. Finally, we are convinced that music was part of the prime means of worship and praise. Instruments as well as singing and dancing, are a part of music. The two instruments selected for review are the ram's horn (shofar) and the harp. This study aims to contribute to scholarly research about the central role of music in secular life and religious rituals as portrayed in the Bible. In addition to the Bible itself, historical, as well as more recent literature was reviewed to determine the role of music in the Bible. Although the study concentrated on the secular and religious use of music in the Bible, it also conceptualised the impact of music on the spiritual well-being of the participants. From the great variety of instruments found in the Bible, the author focused only on two instruments, namely the harp and the ram's horn (shofar). The objectives were to examine the general role of music in the Bible, and also to determine the significance of music in secular life and religious rituals. The literature study of the Old and New Testament, textbooks and relevant peer reviewed journals paid attention to the debate on relevant issues by different researchers, with a focus on both secular and religious reasons for singing, dancing and playing instruments. More recent sources on the themes of the study were accessed and contextualised, considering both Christianity and culture. In addition to singing and dancing, the role of two instruments, the harp and the ram's horn (shofar), in both religious and secular music was examined. We further explore both secular and religious reasons for the use of music, as described both in the Bible as well as historical texts. Secular reasons for the use of music include its soothing effects, and its role in terms of celebrations, military occasions, lamentation or mourning and in annual festivals. In its most primitive forms, music could be used to soothe a child or restive flocks of sheep. Whilst engaging in strenuous or monotonous work (e.g. treading grapes; Jr 25:30 and 48:33) or digging irrigation canals or wells (Nm 21:17-18) or raising a new house or barn, musical chants could be used to help maintain the rhythm of the workers and speed completion of the day's toil (Matthews 1992). In addition to expressing praise and joy, music was associated with varied moods such as consolation, thanksgiving and deliverance. When all is dark, the psalmist finds that the Lord's song is with him as a kind of soothing night time lullaby to pacify him (Ps 42:8). Another common use for music and dance would have been in celebrations, both large and small. These were used to mark the major events in the life of the people or just to express their joy and contentment with life. Thus, in Ecclesiastes 3:4, in the litany of the events of life, dancing is contrasted with mourning (Lm 5:15; Ps 30:11). Not all frivolity was acceptable to the biblical writers; for example, a mocking drunkard's song is mentioned in Psalm 69:12 and in Job 21:11-12 (Matthews 1992:931). Weddings were also occasions in which music and other merriment took place. Samson's riddle, so filled with alliteration and word play (Matthews 1992:931), suggests a chant or plainsong style that would fit into the festivities of his marriage feast (Jdg 14:14). The ritual of the marriage feast also included a staged meeting between the bride and the groom's party; according to 1 Maccabeans 9:39, they were accompanied by musicians playing tambourines (Matthews 1992:931). They and the whole company then joined in songs as the feasting and other activities commenced (Jr 16:9). Curiously, the wedding feasts described in the New Testament (Mt 22:1-13; Jn 2:1-11) do not include any mention of musicians or songs. However, these may have been such common aspects of the feast that they were simply assumed. Births, with their promise of new life and continuity of inheritance, were also marked by ceremony and ritualised singing. Even before the infant was born, chants and incantations were used to guard the birth process and affect a speedy and safe birth (Matthews 1992:934). In preparation for the birth, midwives were called in. In some cases singers were also summoned to celebrate the birth and guard the child. The use of the 'fear not' formula by the midwives in Genesis 35:17 and 1 Samuel 4:20, followed by the mother naming the new-born child, suggest a traditional litany to be sung or chanted at the birth of sons. This is at least partially echoed in the Lucan account of Jesus' birth, where angels tell the shepherds not to fear, then name the child and sing in chorus (Lk 2:9-14). The military also made use of music. This was principally to rally their forces (Jdg 3:27 and 6:34), to guide disparate groups of men on the battlefield, to signal troops to advance (Nm 10:9) or to retreat (Matthews 1992:932). Sendrey (1969:469-470) suggests there may have been preparatory 'war dances' prior to battles; here he cites Ezekiel 6:11, 'smite with your hand, and stamp with your foot', as an allusion to such a dance. Isaiah (13:3), which enjoins the soldiers to consecrate themselves before the coming battle, could also be an indication of ritual activity, including dance. Matthews (1992:932) writes that the trumpets used by Gideon (Jdg 7:15-24) served the additional function of startling the Midianites and aiding in the Israelites' surprise attack. He further states that similarly, the blowing of rams' horns by the Israelite priests in the siege of Jericho added to the psychological effect after the people had marched in silence before the city for six days (Jos 6:3-16)(Matthews 1992:932). In terms of military victories, immense joy was sparked and resulted in spontaneous celebrations (Jdg 11:34). To commemorate these occasions, heroic ballads and songs of praise to Yahweh were composed. Amongst the best examples of these hymns of thanksgiving, are the 'song of the sea' (Ex 15:1-18), the ballad of victory over Sihon and the Amorites (Nm 21:27-30), and the 'song of Deborah' (Jdg 5). Each of these epic poems, as well as the shorter boastful chants of Lamech (Gn 4:23) and Samson (Jdg 15:16), have a rhythmic style. The instrumental accompaniment, whilst subordinate to the reciting of the song, would have helped to create mood, heighten tension, and add to the symmetry of the composition (Matthews 1992:930). Dance, too, would have been a part of these celebrations, as processions of women with hand-drums performed a 'round-dance', as they joined the victorious soldiers or priests on their way to the sanctuary of Yahweh (Matthews 1992:931). The use of music for religious purposes can be seen in both popular as well as institutionalised settings. Music served as part of the process of mourning or lamentation (2 Sm 3:32-34; Jdg 11:40). Funeral processions throughout the Ancient Near East included professional mourners, beating their foreheads, moaning and shuffling to the sound of wailing flutes (Matthews 1992:932). Sickness and premature death were basic facts of life for these ancient peoples. Thus, they created songs, musical noisemakers such as the bells on the robe of the high priest (Ex 28:33-35), and dances with an apotropaic purpose. The hope was that by soothing the sick (1 Sm 16:16) or frightening away the demons who caused the illness, a cure could be effected. 2 Chronicles 35:25 reports of professional singing mourners, male and female who 'spoke of Josiah in their lamentations'. Music was used in different forms and for different occasions, like death. This kind of occasion was painful and heart rendering. Music for this type of occasion would produce feelings of sadness, whereas the music of victory would produce excitement and ecstasy. Thus the writers of the New Testament and the founders of the new Christian movement very likely adopted what they knew of synagogue music to their own worship. That would explain why Paul, who was familiar with musical instruments, considered them 'lifeless' (1 Cor 14:7-8) and promoted worship in the forms of 'psalms, hymns, spiritual songs, singing and making melody to the Lord' (Eph 5:19). The borrowing from synagogue worship of both hymn and chorus singing added the emotional, communal feeling needed to help build the Christian community. Instruction, without the freedom to express joy and praise through some form of music, would have quickly become dull. Sometimes music assumes the quality of a gift and inspiration from God (Ex 31:3, 6, 35:25 and 36:1; 1 Chr 15:22, 25:7 and 2 Chr 34:12; Ps 33:3). David describes himself as the God-anointed singer of Israel's songs (2 Sm 23:1). The Bible also speaks more directly of God as a composer of songs; and of the divine wisdom they contain (1 Ki 4:29 and 4:32). In Psalm 40:3, David claims that it is God who 'put a new song in my mouth'. The New Testament has very little reflection on music. In 1 Corinthians (14:15), Paul encourages a certain method of musical approach. References in the book of Revelation include the singing of the heavenly hosts. There is also a stray remark in two of the Epistles about the singing of hymns and spiritual songs, namely, Colossians 3:16 and Ephesians 5:19. In the New Testament the emphasis appears to be more on personal or congregational singing. Mention is made of the hymn sung by Jesus and his disciples at the end of the meal in the upper room (Mt 26:3; Mk 14:26). Religious reasons for making music included pilgrimages to sacred sites as well as religious occasions such as Passover. An occasion for religious singing would have been during pilgrimages to sacred shrines and temples. This was a common activity amongst the Israelites, starting in the settlement period. For instance, Elkanah and his family annually made the journey to Shiloh to worship before the Ark of the Covenant (1 Sm 1:3). As music became more formal, professional guilds of musicians were employed to form choirs and orchestras which served at the various temples and shrines or in the palace. One sign of this is found in the book of Amos. During his stay at Bethel, Amos harangued against the emptiness of the worship in the temple there, declaring that Yahweh would no longer listen to the worshippers' songs and harps (Am 5:23). Yet another indication of these musician guilds is found in the Assyrian Annals. Following the siege of Jerusalem by the Assyrian King Sennacherib, King Hezekiah was forced to pay a huge ransom for the city. This ransom included male and female musicians (Matthews 1992:933). Following the construction of the temple in Jerusalem and the emphasis placed on annual festivals and sacrifice by the kings (especially Hezekiah and Josiah), annual events like the celebration of the Passover would have brought many people to the city. Along the way, entertainment would have included the singing of pilgrim songs, such as the 'Songs of Ascent' (Pss 120-134), which extol the opportunity to 'go up' to Jerusalem and worship in the sanctuary at Zion. These songs are probably associated with the three great agricultural festivals (Ex 23:17; Dt 16:16) (Matthews 1992:933). There is also a whole group of 'enthronement psalms' (e.g. Pss 2, 20, 72, 89, 101, 110 and 144) which reiterate the Davidic dynasty's right to rule and which were probably used in an autumnal festival to commemorate its founding (Matthews 1992:931). Amongst the events that would have taken place in this annual festival was a grand procession, perhaps using Psalm 68, which exhorted the people, 'Sing to God, sing praises to his Name' (Ps 68:4), in its opening chant. Priests and nobles, advisers and representatives of designated tribes would have marched through the streets of Jerusalem to the temple with 'the singers in front, the minstrels last, between them maidens playing timbrels' (Ps 68:25). Then sacrifices and speeches would be made, which, as in this psalm, would include in condensed form the triumphant acts of Yahweh. The roles of the two instruments selected for further study, the harp and the ram's horn (shofar), in both secular and religious music in biblical times are examined below. The Old Testament refers to the shofar no less than 74 times, which makes it the most frequently mentioned musical instrument in biblical literature (Braun 2002:26). Whilst the harp music calmed the spirit and soul, the shofar was used to grab hold of the attention and spirit of the people. The harp can be referred to as a consoler, whilst the shofar was a preparer. Evidence from the Old Testament made it clear that the shofar had both an important religious and secular function in ancient Israel. Especially in the context of the temple and on the battlefield it featured as an important signal instrument. In biblical times the shofar was sometimes used in conjunction with the trumpet in the temple of Jerusalem (Finkle 2002:8). Every New Year's Day the principal ceremony was conducted with the shofarplaced in the centre, with a trumpet on either side. the Havdalah ceremony that marked the end of a festival (Finkle 2002:6-7). According to Leviticus 25:9-10, the Year of Restoration Festivals was also introduced by the shofar; in addition, it played a vital role in festive activities like the Feast of the New and Full Moons respectively (Hartenstein 2007:121). to 'praise', the description for praise psalms or hymns (e.g. Pss 33 and 113). Musical instruments like the shofar could be used as part of the songs and prayers asking Yahweh to see and hear the worshippers. They could also be used in music and songs of thankfulness, such as thanks during harvest festivals, or when the congregation of worshippers raised their voices in songs of praise, accompanied by the staccato emphasis of the shofar. It is noteworthy that the 'sons of Asaph' are showcased in the ceremony dedicating the laying of the foundation of the restored temple (Ezr 3:10-11), playing trumpets and cymbals and singing responsively a hymn of praise to Yahweh. There were also a number of secular roles in which the shofar played an important role. Signalling in times of war (Nm 10:9; Jdg 6:4; Jr 4:5; Ezk 33:3-6) was possibly the most important. A number of military connotations are also linked to religious music (Jos 6:2; Sm 6:15; 1 Chr 15:25); for example, when Yahweh moves the moment the shofar is sounded (Hartenstein 2007:119). It is in times of war that people also cry out to Yahweh to keep them safe or provide victory over their enemies. The shofars were used on the battlefield to assemble troops, to attack, to pursue and to proclaim victory. At home it was used to warn the people inside the city walls of an oncoming attack. The shofar was also used as an instrument to sound the alarm, as can be derived from Psalms 47:6, 98:6 and 150:5, but this had both military and religious significance (Hartenstein 2007:120). Superhuman intensity was an important aspect of instruments which were close to the sphere where deities moved. The shofar was such an instrument, as can be seen from Exodus 19:16, where its sound announced the cosmic appearance of Yahweh (Hartenstein 2007:120). The blasting of ram's horns by the Israelite priests in the siege of Jericho, just before the walls fell, added to the psychological effect after the people had marched in silence before the city for six days (Jos 6:3-16). In national celebrations the blowing of the shofar was a common practice at the coronation of kings (2 Sm 15:10; 1 Ki 1:34 and 2 Ki 9:13) (King & Stager 2001:296). Hartenstein (2007:121), however, argues that reference to this was not found in the Hebrew texts. No musicians or choirs are mentioned at all in Solomon's formal dedication of the temple (1 Ki 8). Upon reaching the city, David both worshipped and demonstrated his right to rule through the power of Yahweh and the ark by dancing 'with all his might' as horns were played (2 Sm 6:14-15). When Yahweh, as the triumphant King, rises under the loud sound of the shofar in Psalm 47:6, a parallel can be extended to the initiation of new kings in Jerusalem, as seen in the aforementioned Old Testament texts. The shofar is mentioned most in the book of Jeremiah seven times, a further five times in 2 Samuel and five references are found in the books of Judges and Ezekiel. In the book of Exodus the shofar is mentioned four times with three references each in the books of 1 Kings, the Psalms and Isaiah. 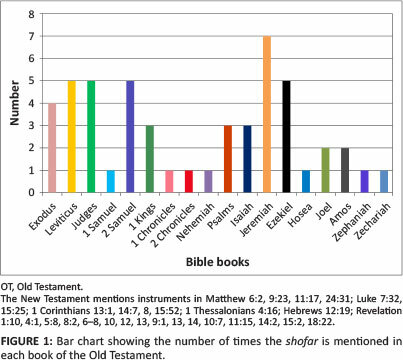 The books Joel and Amos mention the shofar twice each with only one reference in the remaining books of the Old Testament listed in Figure 1. Also relevant to this study is the frequency with which musical instruments were mentioned in the Bible. Most references to the shofar in the Old Testament were in the pre-exilic time (Jeremiah) when Babylon was hauling in the nations of the Ancient Near East one by one. These wars were probably the reason for the frequent mention of the shofar. Eventually, Jerusalem was also besieged and destroyed before its inhabitants were taken into exile. All the references to the shofar in the book of Jeremiah were therefore in relation to disturbance and war. Ezekiel 33:3 mentions that the sound of the shofar served as a warning in such times. Various other texts in the Old Testament stress this point (Jr 4:5, 19, 21, 6:1, 17 and 42:14; Ezk 7:14; Hs 5:8; Am 2:2; Zeph 1:16). It is necessary to mention the importance of the ram's horn blower, commonly referred to as the t'kiyah which means 'blower' or ba'al t'kiyah - the 'master of the blowers'. Although any Israelite could perform this duty, not every citizen was fit to do it: 'The one who blows the shofar should likewise be learned in the Torah and should be God-fearing, the best man available' (Finkle 2002:10). It is, for example, also required that the ba'al t'kiyah will abstain from anything that may cause ritual contamination for three days before the special cleansing ceremony to honour the 'prince of Rosh' or rosh ha-shanah (Finkle 2002:10-11). The shofar sound brought clarity, alertness, and conveyed a message of oncoming danger (Buttrick & Crim 1962:474). Laban,3 upbraiding Jacob for taking away with his daughters, exclaims that 'he might have sent them away with mirth and with songs, with harp and tabret' (Gn 31:27). References to harps lend an otherworldly atmosphere to the picture of heavenly realism (Rv 5:8, 14:2 and 15:2). Most pervasive of all is the singing of the saints in heaven about their redemption (Rv 5:12-13, 7:12, 11:17, 14:3 and 15:3). According to Quasten (1983:40), music was used during the time of the Old Testament to eliminate tensions and obstacles. Elisha used the music of the harp to prepare himself for prophecy (2 Ki 3:15). It reads, 'Bring me a harpist! And the harpist played, and the hand of the Lord came upon him'. David had also entered Jerusalem in procession as the Ark of the Covenant was brought to the new capital city. On that occasion the people sang as they marched to the sound of harps, lyres, tambourines, castanets and cymbals (2 Sm 6:5) (Matthews 1992:931). It is significant that David and all of Israel played before God with all their might on kinnors [lyres], nebels [harps] and timbrels [tambourines]. In 1 Chronicles 15 the names of the players on nebels are carefully recorded. David himself was as proficient on the nebel as on the kinnor, and he set aside special players for special instruments (1 Chr 25:1). In the book of Psalms (21:22, 31:2 and 33:1-2), frequent mention is made of the nebel. This instrument was not restricted in its use to religious ceremonies (Is 5:12). The Bible contains about 20 words for musical instruments, most of them appearing in the book of Psalms. Music, as reflected in the Bible, had significant uses in society. It is suggested from the results that music in biblical times affected people and changed their moods or emotions. In this study, we noted that various musical instruments, including the harp and shofar, were used to create a wide variety of sounds to accompany and stimulate the emotions and behaviour of listeners and participants. Indeed the close relationship between music and religion bears testimony to this. This agrees with the findings of other authors (Hartenstein 2007:119; Ross 2006:255-256). Evidence from the Old Testament already made it clear that the shofar had both an important religious and secular function in ancient Israel. Especially in the context of the temple and on the battlefield it featured as an important signal instrument. In biblical times the shofar was sometimes used in conjunction with the trumpet in the temple of Jerusalem (Finkle 2002:8). Every New Year's Day the principal ceremony was conducted with theshofar placed in the centre, with a trumpet on either side. In more than half of the references in the Old Testament, the shofar appears in relation to war and was probably used mainly as a signalling instrument (Keel 1994:341). Even when used for religious purposes the function of the shofar was probably used mainly to call the Israelites together. Psalm 150 follows a movement from 'inside to outside' which corresponds with the symbolic topography of the second temple of Jerusalem, concentric around the centre of the Holy of Holies. At the innermost part, where Yahweh is unapproachable, the shofar must sound. This signifies the use of the shofar as a leading instrument in Israel's worship practices, apart from its military context (Hartenstein 2007:119). In Jeremiah 4:5, 19 and 21 as well as Ezekiel 33:3-6, we find two examples of the use of the shofar in times of war. Taking into account that theshofar rarely appeared together with other instruments and that it was limited in its range of sound, some scholars suggest that the shofar was simply known for emitting a loud sound and to assemble the people (King & Stager 2001:296-297). The shofar has even been referred to as aLärminstrument which can make noise, alarm or uproar (Hartenstein 2007:119). Douglas and Hillyer suggest that the various usages of the shofar can be viewed under one category, namely that of a signalling instrument (Douglas & Hillyer 1980:473). That is not the opinion of the author. Musical instruments make music, not just noise and are closely linked to deep emotions in the listener or participant. Their use as warning or signals is particularly significant as they are emotive sounds, not just 'noise', calling to people on a deeper level. Yet, two biblical accounts give us a glimpse of the shofar being used as part of the worship of Yahweh. The first account is in 1 Chronicles 15:28 where the shofar joins other musical instruments in 'shouts of exclamation' when the Ark of the Covenant is brought back to Jerusalem. The second account is in 2 Chronicles 15:14, where the shofar joins a number of other instruments in worship of Yahweh as part of the religious reformations of king Asa. Thus, it also was used in addition to its use in signalling and war, much as a trumpet is today, as a musical instrument, in the opinion of the author. The results of this study highlight how music, dance, singing and instrumental playing played a prominent role in assisting people to cope with the demands of everyday life and how music was employed in both secular life and religious rituals in biblical times. It is concluded that whereas the Old Testament proved to be a rich source of information about the musical culture of ancient Israel or Palestine, the New Testament mentions instruments only 29 times;4 yet even that number is deceptive, as of those 29, 12 in Revelations are almost verbatim repetitions. Similarly, the New Testament does not offer any variety even in those 29 occurrences, as only four different instruments can be discerned.It is evident that the shofar is the musical instrument mentioned most in the Old Testament. Although on a few occasions it was mentioned in conjunction with other instruments making music, it was mainly defined as a signalling instrument. It is the only biblical instrument that has remained virtually unchanged throughout history. The shofar played an enormous role in the history of ancient Israel and even today remains a prominent instrument in the Jewish faith, especially on specific religious holidays or festive days on the Jewish calendar. This study is thus a breakthrough to a direction that is different from other research scholars. Our purpose in this study was to give an overview of music in the Bible as a powerful medium of communication, by which human actions and reactions are expressed from one to another.Furthermore, it was suggested that from antiquity, music has been a part of everyday life, particularly at occasions like birth, celebration, battle and mourning. But in the wisdom and poetic books of the Old Testament most of the references to music and song are in the context of prayer, lament, thanks and praise. From this study, it is evident that we can read and interpret the musical texts of the Bible, understanding them as best we can within their literary and cultural contexts, but there is a dimension of music that is more evident in personal experience than description. The findings which have been presented in this study will help us to understand that music is often noted for its emotional affect, but the use of music in praise also tends to focus attention away from oneself to the nature and acts of God, thus functioning to transport one's thoughts to another realm. Thanks to the National Research Foundation (NRF) for financial support that enabled me to collect data for this study. 1.Contrary to 'invented' instrumental music (Gn 4:21), singing is as old as humanity itself. According to postbiblical Jewish legends, singing existed even prior to the creation of man: the song of the angels praising God after the act of creating the world constituted the celestial parallel to the terrestrial song of praise exalting the Lord (Sendrey 1969:159). 2.The kinnor was made of wood. David made it of berosh, but it is recorded that Solomon made some of almug wood for use in the Temple (1 Ki 10:12). The name is traced to a Syrian root - kinroth (Stainer 1914:23). The instrument was used on joyous occasions - on the bringing back of the ark (1 Chr 16:4-6), the account of which shows the importance attached to proficiency on the part of the performers. 3.Genesis 31:27 confirms that Laban is said to have regretted the suddenness of Jacob's departure, because it deprived him of the opportunity of sending him away with music. 4.The New Testament mentions instruments in Matthew 6:2, 9:23, 11:17, 24:31; Luke 7:32, 15:25; 1 Corinthians 13:1, 14:7, 8, 15:52; 1 Thessalonians 4:16; Hebrews 12:19; Revelation 1:10, 4:1, 5:8, 8:2, 6-8, 10, 12, 13, 9:1, 13, 14, 10:7, 11:15, 14:2, 15:2, 18:22.